An interview with the Director of the Institute of Oriental Studies, Vitaly Naumkin, on the problems of the Middle East and the historical roots of instability in the region. – Is the current situation in the Middle East conducive to a quick end to the Arab-Israeli conflict? I’m saddened by the situation as far as prospects for a speedy solution are concerned. And by the fact that any solution will be slow in coming. Everybody talks about how many obstacles there are; I focus on the main obstacle. In my view, that is Israel’s self-destructive resettlement policy, which is even criticized by the country’s loyal friends! Why do I say it’s self-destructive? Because if it continues, soon there will be no chance of creating a normal, i.e., unfragmented, contiguous Palestinian state. The Arab world is coming to believe even more strongly that Israel is an expansionist state. I simply cannot imagine what kind of government it takes, even with the political will and the appropriate agreements, to relocate tens of thousands of Jewish settlers, a number that continues to grow. I understand that in Israel today even a simple issue like freezing construction of settlements arouses fierce debate. It seems that this government has no need of a Palestinian government. And there simply can be no other solution. The occupation cannot continue forever. However, more and more Palestinians are losing faith that a Palestinian state can be created. Despair and complete hopelessness make a poor backdrop for reconciliation. More and more Palestinians are starting to think that their only choice is to fight for a single Arab-Jewish state. And why not? One person, one vote. That’s the way democracy works, and they believe it should appeal both to the United States and to the other Western countries. But that is unacceptable to Israel: it would mean “goodbye, Jewish state.” It seems as though no real peace process stands a chance. – Was there a time in the history of the Middle East when Arab rulers peacefully coexisted with Hebrew kings? In the ancient history of the Middle East the two peoples, who are so similar in origin, did coexist for quite a long time. You’re asking about the time of the Hebrew kingdoms. On the south Arabian Peninsula there existed an advanced nation of the ancestors of today’s Arabs, or ancient Yemenis, who created their own writing system. The Yemenis, who became famous as spice traders, maintained contacts with the Hebrew kingdoms. According to legends of the Yemeni Jews, they were living in southern Arabia as early as the fifth century BCE. (Incidentally, Jews continue to live in Yemen to this day.) During the early centuries of the current era the Jews actively resettled in Arabia; their influence was especially strong in Najran. Muslim legends say that the king of Najran visited King Solomon on behalf of Queen Sheba, accepted Judaism and spread it in the region. And in the third and fourth centuries BCE the rulers of the Yemeni state of Himyar made Judaism their state religion. As you know, Judaism is generally a non-proselytizing religion, but the Yemeni aristocracy, that is ethnic Yemenis, converted to it. According to legend, the Yemenis were required to convert by the Himyarite king Abkarib As’ad, who was taught the new belief by two rabbis from Yathrib (today’s Medina). Yemeni inscriptions dating to that time period mention the people of Israel. After the appearance of a new religion (Islam) and the formation of an Arab Muslim state, the Jews became a minority confession. (Note that by that time they had long since lost their statehood when the Hebrew kingdoms were conquered by Assyria and Babylon.) 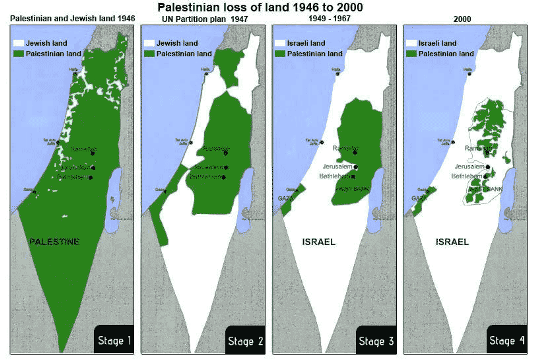 The Palestinian territory was conquered by the Arabs in the seventh century. Incidentally, the Christians had also become a minority confession. The Jews and the Christians both had the status of Dhimmis—people under Muslim protection—and they were almost never persecuted. On the contrary, Jews escaping from the merciless persecution in Christian Europe found refuge in Arab Muslim states and often held high positions, even in the courts of the rulers. – Some of the differences in modern Palestine have clear religious roots. Is it realistic to solve long-standing religious problems by political methods? Indeed, the religious roots of the Israeli-Palestinian conflict are pronounced, but I think that it is primarily a clash of two nationalisms, in both their moderate and extreme forms. There are no situations that cannot be resolved; agreement can always be reached about anything. However, there needs to be a willingness to make concessions. Neither side can get everything it wants. And as we know from history, a preponderance of power is temporary. It’s like a compressed spring; the party that is treated unjustly will eventually lash out. Therefore, one should not put one’s trust in having the advantage. Jerusalem is the capital of all the world’s religions, Christianity also; and I agree with you that the voice of the leaders of the Abrahamic religions is very important. But only politicians can resolve conflicts, whereas religious figures are always representatives of their peoples and thus express the national interest, just like secular people. There is no alternative to a political solution, but why is that? That is the only way to accommodate everyone’s interests. – Are the armed radical groups operating in Afghanistan, Lebanon, Palestine, Algeria, Sudan, Yemen, Iraq and the North Caucasus reminiscent of the national liberation movements of the mid-twentieth century, or do they represent a future problem pointing to the emergence of a new militant tide that has declared war on “unbelievers” and moderate Muslims alike? Don’t compare Palestine with the North Caucasus. The North Caucasus is an integral part of the multi-ethnic and multi-confessional Russian state. Israel is entirely different. No one recognizes its right to the occupied Palestinian territory. There is an understandable desire on the part of the Palestinians to resist the occupation, and extremists in various countries are using it as a mobilizing factor in their own interests. They are also pursuing their own interests when they fight moderate Muslims. But if we’re talking about the Palestinians, there is nothing surprising about the fact that desperation pushes them toward the extremists. The problem can’t be solved without Hamas, but so far the Palestinians have been unable to come to agreement among themselves. As for the international cartel of extremists hiding behind religion, they have no future. – Can the armed religious fanatics and their leaders be enticed to become moderates with talks and international mediation, or is war with them, as Russia’s experience in Chechnya shows, currently the only way to pacify them? What kind of war are you talking about today? Look at how many former fighters are successfully building a new Chechnya within the Russian state and how hard they, along with federal troops, are fighting those who have illegally taken it upon themselves to act in the name of Islam. Force alone won’t get the job done. It is also important for countries, including Russia, to fully support authentic, moderate Islam. – Intensive contacts are now being made to convene an international conference on the Middle East in Moscow. Does the conference have a chance of success if its participants concentrate exclusively on resolving the Palestinian-Israeli conflict, or should the agenda include complete Arab-Israeli reconciliation and relations with Iran? I won’t attempt to predict the outcome of the intensive diplomatic contacts. I would like to see the conference happen. Moscow is a good platform for such an event. In my view, the agenda should cover all aspects of Middle East reconciliation, including the Syrian-Israeli and the Lebanese-Israeli tracks. Iran is not a factor here: it is not a party to the Arab-Israeli conflict and is not really amenable to the peace process, which arouses antagonism primarily on the part of Israel and the United States. However, Iran plays an enormous role in the Middle East, and it will affect its destiny, whether we’re talking about the situation in the Arab-Israeli conflict, in Iraq or in Afghanistan. I see that President Obama has clearly positioned himself as a supporter of a comprehensive and complete (until the final status is determined) reconciliation: not just for Israel and Palestine, but for Syria and Lebanon, as well. In my opinion, his strategy is to promote dialogue and direct talks between all conflicting parties, rather than to impose a settlement. The peace process can be endless, just so long as it is taking place. – What is your overall outlook for how the situation in the Middle East will develop, and what do you think about the prospects for an early proclamation of a single Palestinian state and the possibility of an Arab-Israeli reconciliation? My prediction is not very favorable, although there is no alternative to peace. The government of “refuseniks” in Israel clearly does not want to create an Arab Palestinian state, and without it there can be no peace. That’s why today more and more Palestinians are leaning toward the idea of a single Arab-Jewish state in Palestine. But not everything is going well on the Palestinian side: they still haven’t succeeded in forming a national unity government. Expectations for the Obama-Abbas-Netanyahu meeting in September were disappointed, although I for one had expected nothing to come of it. What do we have on the negative side? First there has been no real progress in the peace process. Second, Israel has not stopped building settlements. Third, it is clear the US position toward the conflict has not significantly changed. Although Obama initially demanded that Israel completely stop building settlements, he later changed his tone when he began talking about the need to “refrain” from building them. But there have been positive developments. First, Israeli and Palestinian leaders have started talking again. Second, the United States wants reconciliation to happen on both the Israeli-Syrian and the Israeli-Lebanese tracks. Third, it is important that Obama is talking about mutual recognition by the Palestinian and the Israeli peoples. Moreover, Abbas is showing every desire to accommodate Israel’s interests to the greatest possible extent—as demonstrated by his cautious position regarding the investigation of Israel’s actions in Gaza. There is some hope for the Moscow conference, assuming it takes place, of course. I’m a pessimist when it comes to prospects for a Palestinian-Israeli reconciliation, but a breakthrough on the Syrian-Israeli track is not out of the question. But that wouldn’t be enough. I fully appreciate Israel’s desire to ensure the safety of its people, but I’m convinced that the current government’s policy is hurting its interests. Understanding that, Gershon Baskin, an Israeli public figure, has proposed the idea that the Security Council, followed by the entire UN, recognize the Palestinian Authority as a fully independent state. This would automatically make Israel’s occupation of Palestinian territory outside the law. There can be no peace with the occupation. The interview was given to a Russian newspaper in November 2009.